Bill Hamilton, to judge by the cover of his autobiography Man on the Spot: A Broadcaster's Story, is a well known and significant BBC reporter of his era; the quotes on the back praising him come from the Duchess of York, John Motson and the first post-communism President of Albania Sali Berisha. I've heard of all of them (though I'd have struggled to name Berisha from memory), and yet Bill himself I wasn't previously familiar with. This comes from being a mite too young and unaware while he was at his career apex as a BBC reporter during the 1980s and early to mid-90s; while I can recall a time when there were only four terrestrial channels and can remember a couple of BBC news figures from the period (though moreso weathermen, probably due to the much more colourful BBC weather map of the era being captivating to a young mind), Bill Hamilton was new to me, and so I embarked on the unusual exploit of reading the autobiography of someone I didn't know. I acquired this book as a gift; my grandmother, very familiar with BBC figures both past and present, saw him give a talk and thought I may find his book of interest, him having been a presenter and my having been a presenter on my university's radio station for four years. A look at his career path though shows a depth of experience way beyond my own ability to talk and put on a song when things slow down. He started as a trainee reporter on a local Scottish newspaper, The Fife Herald, and from there worked as a sports reporter on the Hartlepool-based Northern Daily Mail before becoming a local television reporter. From there he joined the BBC as a sports reporter – one of several stints with the BBC, the last of which would see him become a national news reporter and so a familiar face to millions. As well as this varied journey through the media, Hamilton also had a career as a Football Association referee; he's not shy of noting that, with refereeing and journalism, he found himself committed to two unpopular professions. Hamilton, born in 1943, begins with his early life in Dundee in the 1940s and 1950s. This section is evocative while conveying a 'we were poor, but we were happy' vibe that we in our more cynical time, when the Wi-Fi going down is a domestic crisis, may be inclined to question as a romanticised reflection on a deprived time. What comes through clearly though is a strong sense of family and community, and also of religious commitment; church and the Boys' Brigade play a big role in his childhood story, and he even seriously considered joining the Presbyterian clergy. Striking to me was a brief reference to staying with his grandfather and listening to the radio and, if they stayed up late and the national anthem came on, they stood to attention. In the modern era, when the anti-Union Scottish National Party have long dominated Scottish politics, this patriotism toward the United Kingdom can feel surprising, until you of course remember that this was within a decade of World War Two when Scots fought alongside the English without hesitation. Later in the book he mentions his earliest memory being running around the garden waving the Union Flag on VE Day. Throughout the earlier sections of Hamilton's book are small details such as this that make you stop and think about how much has changed within living memory. Patriotic to Great Britain they may have been, but Hamilton's Dundee community were no less proudly Scottish, and so he records that it was with some trepidation he revealed to them that he had applied to be a referee to England's Football Association rather than Scotland's. His second chapter records his early refereeing career; a football fanatic throughout his childhood, he found his talents on the pitch as a player lacking, but gained an interest in officiating instead and became Scotland's youngest referee at age 14. When journalists visited his house to take pictures and record this accomplishment though, upon seeing how they got to hang around drinking coffee for three hours for what amounted to ten minutes of actual work, it crossed his mind that journalism may be the career for him. He goes on to explain his career progression as a referee for the rest of the chapter, including a few hairy incidents along the way. Hamilton's tales of refereeing are confined here, and it's not entire clear how it fits in with the story he tells in the rest of the book; he mentions still refereeing sixty seasons later and having calculated that he'd spent four solid month's worth of time doing it (therefore around two thousand matches), but we don't get much understanding of how he juggled this commitment with the rest of his career, particularly at the BBC when a single phone call at any time could uproot him to a foreign assignment for weeks on end. He signs off this chapter musing on how he's seen the power of football bring people together in war-torn places around the world, aided by the limited paraphernalia a game requires (which any child who has used jumpers for goalposts can attest), though I have a hard time visualising a plastic bag or broken bucket being used for a ball as he describes. Chapter 3 onwards describes the start and progression of his journalism career, beginning at The Fife Herald in 1962, and subsequently south of the border to Hartlepool. Another theme emerges during this time, which is the strong regional identity of people and the careless reform of institutions that reflected this. Such is the case with Scotland's local government burghs, unique and somewhat quirky bodies of independent councillors, provosts and personalities running amok, but nevertheless a source of pride and continuity for the communities they served. Burghs had existed as administrative divisions since the 12th century, though of course had been subject to occasional reforms down the line, but were ultimately abolished altogether by an act of Edward Heath's government which came into effect in 1974, doing away with these old institutions and depriving the communities of Scotland of this unique source of local character. So too was a more modern instrument of regional community lost in the merging and reform of regional television areas. After Hamilton's spell as a newspaperman, in 1966 he became a reporter for Tyne Tees Television local news, and (with a first spell at the BBC as a sports presenter in between) would then go on to take a similar role for Border Television. Along with the often twee anecdotes you'd expect from such a job, he also explains the production process at the time and the daily rush to have the show content together for the evening broadcast, sometimes relying on having a man with a guitar available to perform in case they couldn't get a piece together in time. The importance and variation of regional television output has reduced hugely since that time, and increasing interconnectedness means that the independent character of the productions has been lessened. Hamilton describes his disappointment at Tyne Tees Television now being a relatively small operation run out of a Gateshead business park, and the loss that regional television's decline was to its audience who could watch with pride their local achievements, disappointments and stories. From the north of England, Hamilton returned to his native land to work as a presenter and reporter for the BBC's Reporting Scotland, and his stories here contain a fascinating snapshot of a modernising world in the early 1970s. We hear of how the discovery of North Sea oil bolstered the SNP, the small populations of Scottish islands being connected to the electrical grid and modern phone lines, and he even tells his own tale of sighting the Loch Ness Monster. Hamilton's job-hopping took one more step to a new independent radio station before settling firmly and finally within the BBC as he became a reporter covering Scotland, and it's here that the book takes a permanent turn from the wistful descriptions of Britain past and how journalism was then conducted to weightier and often more tragic stories. It's in this Scotland role that he records in the book's most vivid chapter finding with a hired helicopter a derailed train in the Highlands in 1978 during blizzard conditions, and the unfortunate fate of many motorists who had been trapped in their cars as they had snowed over, leading to some surprising rescues but also multiple deaths. It was in 1979 when bittersweet fortune would propel Hamilton's career to the biggest stage; on a month-long attachment to work with the national news output in London as part of a project to bring in regional reporters, he was nearby when a car bomb attack on the House of Commons killed Shadow Northern Ireland Secretary Airey Neave, and his reporting of the event led to his most prestigious role as a national news reporter. This included a lot of time in Northern Ireland itself and he recounts with particular interest the story of Derry City FC and its position within the sectarian divide. The subject of Northern Ireland returns again later following the IRA bombing of the Conservative Party conference at the Grand Brighton Hotel in 1984, and Hamilton details the police efforts to track down the bomber and how in doing so they foiled a plot to conduct a series of bombings across London and seaside locations that summer. He would later meet and interview two members of the culpable terrorist cell: the Brighton bomber himself Pat Magee and Martina Anderson, who has gone on to become a prominent Sinn Fein politician. Both were freed from prison due to the Good Friday Agreement. Hamilton's role as a national news reporter would see him report on many stories of national and international historical importance, and consequently the second half of his book has less in the way of light-heartedness than the first. The 1980 Algerian earthquake, the 1981 Toxteth riots, the 1982 Israeli invasion of Lebanon, the 1984 Libyan embassy siege and the grisly story of Dennis Nilsen, one of Britain's most prolific serial killers, are all covered with plenty of the kind of interesting details you get from a professional firsthand observer. There are though also a few amusing stories, such his being able to directly reach the President of Zimbabwe just by a number from a phone book and John Paul II managing to down a pint of Polish beer in one during his 1982 papal visit to the UK. It would be the subject of Albania where Bill Hamilton made his biggest journalistic impact; after a visit there for an England World Cup qualifier in 1989, he made numerous requests to their Department of Foreign Affairs to visit the country, then largely unknown to the outside world due to the extreme repression of communist dictator Enver Hoxha. Eventually his persistent requests paid off a year later as he and a camera crew became the first outside journalists to document life in the country. What he uncovered was untold misery as horrible as could be imagined: labour camps where families had been condemned for so long that two further generations had been born into them, the testimony of the torture endured by priests as the state abolished all religion, and orphans and disabled children left in dilapidated and squalid institutions in conditions as unsanitary and undignified as can be imagined. Hamilton's report from Albania sparked immense interest and charitable outpouring. After its broadcast he received a call from the Duchess of York Sarah Ferguson, then at the height of her tabloid controversy, but also the founder of the charity Children in Crisis. She accompanied Hamilton on a trip to Albania to see conditions herself, and he describes a compassionate woman unafraid of getting closely involved. Another companion on a later trip was Norman Wisdom. It's a fairly well known piece of trivia that Wisdom was well-loved in Albania, but I wasn't aware until now of the reason: under Hoxha's regime, Wisdom's films were the only ones allowed as he felt they represented class struggle; for the people though, Wisdom's comic antics were respite from the general misery of their Stalinist existence, and so Pitkini, as they affectionately knew him after his character Norman Pitkin, was well loved by that nation all the way through to his death in 2010. In the penultimate chapter there is a return to the look at Britain's past as he records gathering testimonies from people for the 50th anniversary of VE Day and VJ Day in 1995, some positive but others heartbreaking, such as the men who returned from Japanese prisoner of war camps only to receive no treatment to cope with the mental trauma that had been inflicted, and another of a man who was the only one of six brothers to have survived the war and hadn't found it in him to visit their graves until the making of the documentary shorts. By the end we understand the nature of Hamilton's job as a reporter: to act as the conduit for information, letting events themselves unfold rather than actively shaping them, and the book itself is written with the same ethos as he describes the stories largely uncoloured by his own editorialising. He retains the impartiality of a BBC employee for the most part when discussing things of political significance with few lapses, and occasionally though not overbearingly invokes his Christian faith, particularly when it comes to the more tragic events he covers – so far as his grappling with the problem of evil goes, he doesn't seem to have absorbed Presbyterianism's usual Calvinism. Man on the Spot is also almost entirely about Hamilton's career rather than personal events, particularly beyond the early chapters. Life events, such as getting married, buying a house and the birth of his daughter, are only briefly mentioned. While covering a lot of time, Hamilton breezes through, giving enough detail but never getting bogged down at any point. It's punctuated with comment and observations ending in exclamation points, rarely actually funny as such, but nevertheless in clear good humour. The book isn't strictly chronological as he'll often stick with a subject well into his future before returning in the next chapter to where he left off. During the earlier chapters and before his role as national BBC reporter, there's a shortage of information sometimes to nail down exactly when the time period he's covering is (at one point a mention of Margaret Thatcher being Leader of the Opposition was the only clue I could see), exacerbated perhaps by the rate at which he changes employment; coupled with the book's brevity, the way he went through jobs in the first half put me in mind of Mr Benn. 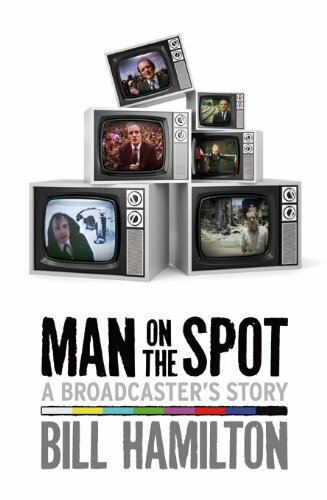 Man on the Spot then is certainly a book of two halves, the earlier half characterised by its look at aspects of Britain of yesteryear, invoking a nostalgia for a time I never experienced, much like a good episode of Heartbeat, but it's also of great interest for its descriptions of media production techniques of the time. The latter half gives us a well told first hand account of many significant events from the 1980s, and a unique look at Albania from the perspective of the first western journalist who was allowed to cover it. The variety makes for an interesting and compelling read, and Bill Hamilton himself is an affable narrator of his fascinating career.